Several teasers have been spotted in Call of Duty: Black Ops 4’s Blackout mode which appear to be hinting at the game’s next Operation. The next Operation is already on players' minds with Operation Absolute Zero releasing before it, and it seems Blackout players are already finding the first signs of it in the game mode’s sole map. Several days ago, a player noticed some surveying stakes had popped up around the map, those objects being short wooden sticks with yellow markers tied around them. 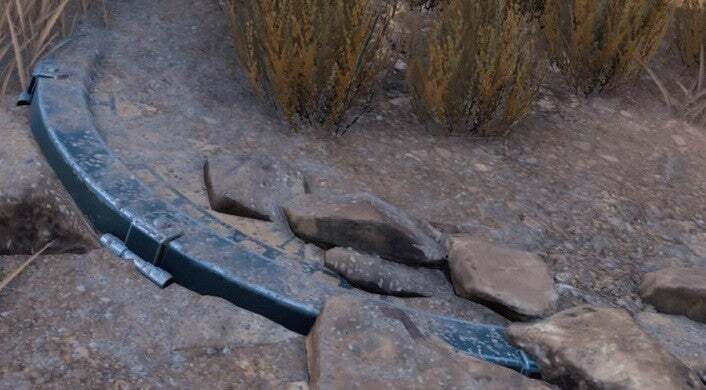 Treyarch replied to that thread to say it was “interesting” that the stakes were showing up around the map. Following that reveal, other players started looking for the rest of the surveying stakes to figure out where they were. From Firing Range to the Fracking Tower and in many other areas around Blackout’s map, there are several stakes which players have been finding and cataloguing here to keep track of them all. There’s also a disc-like object that’s been spotted between the G7 and G8 quadrants of the map. Theories about this object ranged from calling it a bunker door to saying it might be a teleporter pad like the ones seen in Call of Duty’s Zombies modes, but one of the latest suggestions says that it might be a clock instead. Treyarch appears to be well aware of the community’s speculation regarding its new Operation teasers. If you head to the Treyarch Studios Twitter account, you’ll see that the studio has changed its profile image to be one of the surveying stakes that players are hunting for in Blackout. That object that’s partially buried under the ground is also shown as the cover photo, though the account hasn’t directly tweeted about anything pertaining to these two teasers. What all Treyarch is planning on including the new Operation remains to be seen, but it’s expected that it’ll bring about new Blackout features like more points of interest similar to the cruise ship added recently to recreate the Hijacked multiplayer map.